Isabelle Collin Dufresne (1935-2014) was born and educated in France but moved to New York aged about 18 to live with a sister. She met Salvador Dali and became his lover. Dali introduced her to Andy Warhol in 1963 and, at Warhol’s suggestion, she took the moniker “Ultra VIolet” – a reflection of her habit of dying her hair violet of purple. She was an artist in her own right and an author, publishing an autobiography entitled Famous for 15 Minutes: My Years with Andy Warhol in 1988. One aspect of her career that Wikipedia fails to mention is the recording of an LP in 1973. Capital Records A & R man Jeffrey Cheen heard Ultra Violet singing in a club and approached her after the show to suggest she record an LP. According to the interview Paul Maréchal had with her in 2008, she took singing lessons after the invitation to make the record and these significantly altered her singing style, much to Cheen’s disappointment. He felt her voice before the singing lessons had a more natural feel. Ultra Violet designed the cover at The Factory. Warhol had taken a number of Polaroid pictures for the cover but Ultra Violet and Warhol could not agree as to which to use, so Ultra Violet chose a photograph taken in 1967 by photographer/jazz record producer Lee Kraft, which showed Ultra VIolet’s profile poking her tongue out. One of Warhol’s Polaroid pictures was placed on the back cover. Back cover of Ultra Violet’s 1973 album with Warhol’s Polaroid picture. 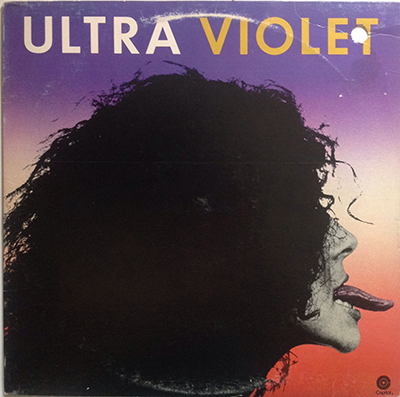 Ultra Violet, in her interview with Paul Maréchal said that the album was never officially released, but copies were pressed and packaged and a number have found their way into collectors’ hands. 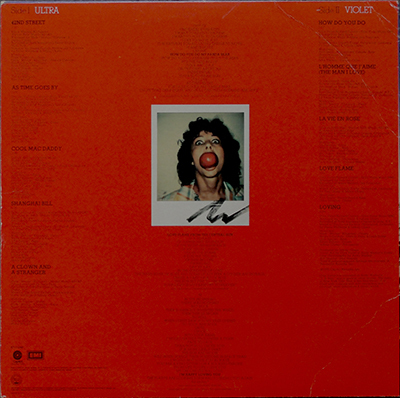 Almost half of these copies have holes punched through the cover at top right, indicating that these albums are cut-outs, that could be sold at a lower price that the official $5.98 retail price. Some experts suggest that the hole indicates that the album was a promotional copy, but I doubt this. Ultra Violet cover with cut-out hole at top right. No one knows how many copies of the record exist. There are sixteen listed on Popsike.com, seven of which have the cut-out hole. There are only two copies catalogued on http://www.rateyourmusic.com, so I would hazard a guess that less than fifty copies in total have come to light, making this one of the rarest covers associated with Andy Warhol.